In the 2017 Georgia High School Association state baseball championships, region rivals met for state titles in Class 7A and 4A. Etowah swept Woodstock for its first state title in 7A, while Marist topped Blessed Trinity in three games in 4A. This past week produced rematches between the teams in both classifications. However, the results were different. In Class 7A, Woodstock won the first two games of the series before Etowah rallied back to take the final game. In Class 4A, Blessed Trinity rolled to three wins over Marist to strengthen its grip on the top spot in the Region 7-4A standings as well as the state’s top ranking. Woodstock won the first game of the three-game set 6-1 on March 27 when pitcher Josiah Siegel allowed just a run on three hits, while Brennan Milone went 4-for-4 with two homers and five RBIs. Spencer Keefe also homered. Then the Wolverines took the second game on March 28, 7-1, as Keefe went 4-for-4 at the plate with a double, two homers and four RBIs. Milone finished 2-for-3 to help Zach McManus earn the victory on the mound. McManus allowed one run in six innings and struck out six. But Etowah rallied to take the second game of the doubleheader 6-1 on March 28 and avoided getting swept. Pitchers Bryant Madden and Nick Torres combined to allow Woodstock just a run on two hits. Jacob LeFevers went 3-for-3 with an RBI, while Nick Block and Andrew Shaw finished with two RBIs each. In Class 4A, Mickey Skole’s grand slam broke a 1-all tie and helped Blessed Trinity to a 5-1 victory in eight innings in the first game of the three-game set on March 27. It spoiled Marist pitcher Seb Thomas’ outing. The right-hander, who defeated Blessed Trinity in Game 3 of last year’s state championship series, got a no-decision in a seven-inning outing. He allowed just a run on five hits. Marist’s James MacCallum went 2-for-4 at the plate. Then the Titans swept a doubleheader on March 28, winning 5-2 and 9-4. Pitcher Sebastian Szot allowed just two runs on four hits in 6 2/3 innings, while CJ Abrams went 3-for-3 and Skole went 2-for-4. In the 9-4 win, Josh Voss hit two homers, including a grand slam and finished with six RBIs. Steele Chambers went 4-for-10 with a double in the series, while Jake Smith finished 3-for-9 with a double and three RBIs. Brookwood defeated Class 5A power Loganville 3-1 on March 28. Pitcher Alex Flood allowed just a run on four hits to outduel Loganville's Seth Clark. Trace Twardoski went 2-for-3 with three RBIs to lead the Broncos. Colquitt County won two games in Columbus on March 26. Pitcher Dylan Collins allowed just one run on three hits in a 5-1 complete-game non-region victory over Columbus High. Collins benefitted from a four-run seventh inning when Tanner Wilson’s grand slam broke a 1-all tie. Then three Packer pitchers --Turner Sircy, Jared Horne and Cory Newsome -- combined to allow Shaw just a run on six hits in a 5-1 victory. Mack Crosby went 2-for-3 at the plate with a pair of RBIs. But the Packers managed just five hits in a 2-1 loss to Cairo on March 28. Dylan Dalton went 2-for-3 to lead the offense, while Raines Plant was 1-for-2 with an RBI. The Packers are 14-6. Newnan took a pair of games from rival East Coweta. The Cougars won 5-2 on March 27 as Thomas Collins went 3-for-4 with two doubles and two RBIs. Elliot Schubert added two hits. The Cougars then took a 4-1 victory on March 30 behind pitcher Jake Martin's complete-game victory. Martin threw a no-hitter and struck out eight. Woody Waters and Jacob Blair each went 2-for-3 with RBIs. Hillgrove has won 12 in a row and improved to 17-4 with three victories over Marietta. In a 6-5 win on March 26, Wade Richardson and Justin Tew led the offense with two hits each. Richardson and Cameron Fiveash finished with two RBIs each. In a 5-0 shutout on March 27, pitcher Jared Rine allowed just five hits in 6 1/3 innings. He struck out nine. Richardson led the offense going 2-for-3 with an RBI, while Will Hubbell’s double drove home two runs. In an 11-3 victory on March 28, Jarrett Jenkins hit a three-run homer, while Hubbell went 3-for-5 with two RBIs. Richardson and Reid Brown each finished 2-for-4 with two RBIs. Lowndes had its seven-game winning streak snapped in a 13-2 loss to Florida High School power Lawton Chiles High on March 28. C.J. Rose, Tyler Andrews and Dalton Smith all went 2-for-3 to lead the Vikings’ offense. Lowndes is 15-6. North Gwinnett took three games from Mountain View in a key Region 6 series. The Bulldogs took an easy 9-2 victory on March 26. Michael Borah’s solo homer sparked a three-run first inning and the Bulldogs never looked back. Will Bennett went 3-for-4 with a double and a homer. Corey Collins added a two-run homer to help pitcher Walker Cleveland earn the victory. Ryan Watson allowed just six hits in a complete-game 7-0 shutout on March 28. Bennett went 2-for-3 with two RBIs, while Borah and Shuler collected two hits each to pace North Gwinnett's 10-hit attack. Garrett Spikes and Jackson Peck had two hits each for Mountain View in the loss. But North Gwinnett needed eight innings to beat Mountain View 2-1 on March 30. North's Brandt Pancer and Mountain View's Chase Chaney locked horns in a pitcher's duel before Max Williams drew a bases loaded walk to force home the go-ahead run. Walker Cleveland pitched a scoreless bottom of the eigth to earn the save. Alexander won three games in Region 5 play, defeating Tri-Cities 25-0, Douglas County 10-2 and Douglas County 7-1. Alexander pitcher Nathan Mapstone struck out 15 and allowed two unearned runs on four hits in a 10-2 victory over Douglas County on March 28. Austin Slate went 3-for-4 with three RBIs, while Brandon Raiden went 3-for-4 with an RBI to lead the offense. Raiden then allowed a run on four hits to earn a complete-game 7-1 victory over Douglas County on March 29. Zac Warren finished 2-for-3 with four RBIs to lead the offense. Alexander improved its record to 16-6. Brunswick lost two of three to cross-town rival Glynn Academy. The Pirates are now 14-8 on the season. Hunter Goff went 2-for-4 and was a bright spot for Brunswick in the 7-0 loss on March 27. Hunter Trawick hurled a three-hit shutout to lead the Pirates to a 7-0 win on March 28. Goff went 3-for-4 with a triple and RBI, while Matthew Trawick went 2-for-4 with an RBI to lead the offense. Joe Smith had a triple to score a pair of runs. The Pirates managed just five hits in the 9-2 loss on March 29. During the three games, Goff went 6-for-10 at the plate with a triple and an RBI. Creekside has been a surprise in Region 5. The Seminoles knocked off Northgate 4-3 on March 26. Creekside overcame a 3-0 deficit with a pair of runs each in the fifth and sixth innings to help Eduardo DeSantos earn the victory in relief of starting pitcher Donovan Bentley. DeSantos went 2-for-3 with two RBIs. Nathaniel Vance also collected two hits. But in a 2-0 loss to South Paulding on March 27, the Seminoles managed just four hits. Effingham County took two of three against Richmond Hill to send the Wildcats tumbling out of the polls. Effingham's Ethan Johnson hurled a complete-game five-hit shutout on March 26 to lead Effingham to a 3-0 victory. But Richmond Hill pitcher Nick McCollum struck out 10 in a four-hit complete-game shutout to help the Wildcats win 3-0 win on March 28. Cameron Gilkey paced Richmond Hill at the plate, going 2-for-3 with a double and three RBIs. But Effingham took the finale 11-5. Jerid Stokes went 2-for-3 with three RBIs to lead the Rebels. Christian Campbell, Zach Wilson and Chandler Hinely collected two hits each. Jackson Finley and Brandon Schwier collected two hits each in the loss for Richmond Hill. Glynn Academy took two of three from cross-town rival Brunswick. The Red Terrors won 7-0 on March 27, lost to Brunswick 7-0 on March 28 before defeating the Pirates 9-2 on March 29. Pitchers Will Bowdoin and Bo Pierce combined on a two-hit shutout on March 27. Randon Jernigan and Hunter Hall led the offense with two hits each. Hill Hartman added an RBI triple. In the 7-0 setback on March 28, the Red Terrors finished with just four hits. In the final game of the three-game set on March 29, pitchers Paul Hegeman and Pierce combined to allow just two unearned runs on four hits. Hegeman was the winning pitcher and also had two hits and three RBIs at the plate. Jernigan and Hall also finished with two hits each as Glynn Academy improved to 18-2. Greenbrier has lost four in a row after dropping three games to Heritage-Conyers last week. In a 3-2 loss on March 28, pitcher Chase Dollander pitched well enough to win but fell on the short end after allowing just two runs on two hits in four innings. Jonathan Cole went 2-for-3 at the plate with a solo homer. Cole went 1-for-3 with another homer in an 8-5 setback on March 29, while Hayden Harrison went 2-for-4. Greenbrier is now 14-7. Heritage-Conyers took three games from Greenbrier in Region 3 play to improve to 16-6. The Patriots won 3-0 on March 26, 3-2 on March 28 and 8-5 on March 29. Griffin Holcombe hurled a two-hit shutout in the 3-0 victory, while Ray Joseph went 3-for-4 with a triple and an RBI and Caleb Ramsey went 2-for-3 with a double. Pitcher Nick Watson-Garcia helped Heritage to a 3-2 win on March 28, going 6 2/3 innings. He struck out six and allowed just four hits. He also had an RBI at the plate. Then Heritage used a 2-for-4 performance from Watson-Garcia to help Nolan Woodward earn the victory on the mound. Watson-Garcia added a homer and finished with two RBIs. Houston County and Valdosta split a pair of Region 1 games on March 30. The Bears won the first game of the doubleheader 4-2. But Valdosta took the nightcap 4-3 in 11 innings. In the first game, pitchers Cameron Jones and Chandler Dawson combined to shut down Valdosta's offense. Jones went 4-for-4 to lead the Houston offense. Dawson and Corbet Luna finished with three hits each, while RJ Preston and Dillon Toms had two hits each. Dustin Doscher went 2-for-4 to lead Valdosta. Colby Thomas' single in the 11th helped the WIldcats break a 3-all tie and capture the 4-3 victory. Thomas finished 2-for-4 to lead the Valdosta offense. Luna, Jones, Connor Martin and Jacob Profit all had two hits for Houston County. Lee County finished the week with a pair of Region 1 wins over Northside-Warner Robins on March 29 to improve to 14-5. The Trojans took the first game of the doubleheader 13-1, then followed with a 14-5 victory. Pitcher Layne Wiard earned the five-inning victory, allowing just an unearned run on two hits. Spencer Hanson, Seth Nelson, Jacob Barwick, Logan Goff and Brian Myler finished with two hits each. Hanson finished with four RBIs and a triple. In the 14-5 victory, Jonathan Logsdon went 3-for-3 with a triple and two RBIs, while Nelson went 3-for-4 with four RBIs to lead the offense. Drew Feagans finished 2-for-3 with a pair of RBIs. Earlier in the week on March 26, the Trojans lost a 4-1 decision to Veterans. Garret Suiter went 2-for-3 with a double and an RBI in the loss. Scotty LeSieur hurled a complete-game two-hit shutout to help Pope to a 3-0 victory over Johns Creek on March 26 in Region 7 play. Buddy Floyd went 2-for-4 with a double to lead the Pope offense. The Greyhounds shut out Chattahoochee on March 28 behind pitcher Max Pralgo's 13 strikeouts. Connor Frost went 2-for-3 with an RBI, while Caden Smith finished with a single, a double and a triple. In a 4-3 victory over Alpharetta on March 30, Andrew Herlitz earned the victory on the mound with LeSieur earning the save. Arabia Mountain finished 2-1 during the week with a pair of big wins over Chamblee. The Rams lost a 3-0 decision to Eagles Landing Christian on March 27. In a 5-2 victory over Chamblee on March 28, Corey King was the winning pitcher and also went 2-for-2 at the plate with a pair of doubles and two RBIs. Juston Jordan also went 2-for-2. In the 11-0 victory on March 26, pitcher Jordan Sterling allowed just three hits in a five-inning shutout. King went 3-for-3 with a triple and four RBIs on offense, while Judah Hill, Tyson Scott and Sterling finished with two hits each. Hill finished the game with a double, a homer and four RBIs. Buford’s offense combined to score 33 runs in a pair of Region 8 wins over Cedar Shoals and Clarke Central. In a 12-0 win over Clarke Central on March 26, pitcher Sean Adams allowed just one hit in 4 1/3 innings and struck out nine, while Noah Ledford went 3-for-3 at the plate with two doubles and two RBIs. Austin Turner, Griffin Price, Reece McIntyre and Pat Walker finished with two hits each. In a 21-0 three-inning victory over Cedar Shoals on March 28, the Wolves scored all of their runs in the first inning. Walker went 2-for-2 with four RBIs, while Ledford added a three-run homer. Buford is 12-8. Chamblee lost a pair of region games to Arabia Mountain, falling 11-0 on March 26 and 5-0 on March 28. The Bulldogs managed just seven hits in the two losses. Chamblee did finish the week with a 10-9 victory over Weber. David Albuquerque, Matthew Welsh and Marshall Peters finished with two hits each. Chamblee is 16-7 on the season. Decatur picked up three wins – a 15-0 victory over Grady on March 26, a 10-0 victory over Grady on March 28 and a 12-1 win over Maynard Jackson on March 29. In the 10-0 win over Grady, pitcher Hayden Flinn earned the victory allowing just a hit in five innngs and notching six strikeouts. Jaylen Paden, Jarrett Ford and Jake Vaughan finished with two hits each. In the victory over Jackson, Jordan Walker earned the victory on the mound, while Ford, Tim Conway and John Griffin finished with two hits apiece. Jonathan Paden added a two-run homer. The Bulldogs are 16-5 on the season. Jones County defeated Locust Grove for the second time in three days on March 26. But the Greyhounds had to cut down a late seventh-inning rally to post a 7-6 victory. Colby Gordon earned the victory on the mound, while Teldrick Ross went 4-for-4 with a double, a homer and four RBIs. Jackson Mix went 3-for-4 with a homer and three RBIs. Kole Vickers had two RBIs for Locust Grove. The Greyhounds finished the week with a pair of wins over Hampton. Pitcher Hunter Pierce allowed just one hit to help Jones defeat the Hornets 11-1 in six innings on March 28. Gordon and Seth Daniels finished with two hits each. Dawson Barnes then hurled a complete-game one-hit shutout in a 3-0 victory over Hampton on March 29. Ross added an RBI double. Jones County has won nine straight and is 15-6 on the season. After dropping a 7-6 decision to Jones County on March 26, Locust Grove finished the week strong with a pair of wins over Union Grove. The Wildcats took an 8-2 victory on March 28 and a 5-3 win on March 29. Gavin Lee earned the victory on the mound on March 28 and also went 4-for-4 at the plate with two doubles and an RBI. Nolan Crisp, Austin Moody and C-Jay Upchurch each finished with two hits. In the 5-3 win on March 29, Crisp struck out 11 and allowed three runs (two earned) to earn the complete-game victory. Lee finished 2-for-3 with a double and an RBI. Locust Grove is 15-7. Just three days after Flowery Branch handed Loganville its first loss in Region 8 play, the Red Devils retaliated on March 26 behind Bay Witcher’s three-hit shutout. Witcher threw just 98 pitches and struck out six. Joseph Brandon went 1-for-3 with a pair of RBIs, while Bryant Pietri went 2-for-2 with a double and an RBI. The Red Devils also defeated Collins Hill 5-1 on March 29 behind a 3-for-4 offensive performance from Blaine Marchman. Lance Spooner also went 2-for-2. Loganville did drop a 3-1 decision to Brookwood on March 28. A bright spot was Justin Moss who went 2-for-3 with an RBI. The Red Devils are 14-6 on the season. North Springs rolled to three easy victories to improve to 11-9. The Spartans defeated Lithia Springs 5-1 on March 26, defeated Lithia Springs 21-6 on March 28 and routed carver-Atlanta 30-2 on March 29. Beau Foster struck out 10 allowed just one unearned run and four hits to pick up the complete-game victory on March 26. Veterans won two of three this week, including a split with Harris County in a pair of key Region 1 games. The War Hawks won the first game of the doubleheader with Harris on March 30, 2-1. But the Tigers won the second game 13-3. In the first game, Daniel Hawthorne and Derek Wylie combined to allow Harris County just a run on five hits. Leyton Pinckney went 2-for-3 to lead Veterans, while Jacob Pierce had a two-run homer. The loss spoiled a 3-for-3 performance from Harris County's Timmy Brooks. But the Tigers' Joah Lee allowed just two earned runs on five hits in a 13-3 victory. Jason Whearly went 3-for-3 to lead Harris at the plate. Wylie went 2-for-3 with a homer and two RBIs in the loss for Veternas. The War Hawks knocked off Lee County 4-1 on March 26 behind a nine-hit offensive performance. Pinckney, Wylie and Jemalle Simmons collected two hits each to help the Warhawks. Cole Hicks earned the victory for Veterans, working six scoreless innings. Ware County split a pair of games against higher classification teams. The Gators defeated Coffee 7-1 on March 28, before falling to Tift County 3-1 on March 29. Jake Manders earned the victory on the mound against Coffee, while Gage Bray, Derrin Cox and Demarco Gibson finished with two hits apiece. But Ware managed just five hits offensively in a 3-1 loss to Tift County. The Gators are 10-10 on the season. Whitewater was idle this past week, but the Wildcats are 10-9 and have won six straight games. Whitewater has outscored its competition 36-3 during its six-game winning streak. Eastside dropped three games to Woodward Academy. Ryan Shirley went 4-for-11 at the plate in the three-game set. The Eagles are 16-4 on the season.with three RBIs. Jefferson established itself as a major player in Region 8 after taking three games from Stephens County. Jefferson snapped Stephens County’s nine-game winning streak with a 2-1 victory on March 26. Pitcher Patrick Hickox allowed just one run on four hits and struck out four to earn the complete-game victory. Lance Watkins went 2-for-3 at the plate with an RBI to lead the Dragons. Mason Cooper also added an RBI. Chaz Bridges went 2-for-3 for Stephens. Then in a 1-0 victory on March 28, Jefferson pitchers Brandon Trefren, Vinny Farley and Derrick Vaughn combined on a three-hit shutout. Justin Cole went 2-for-3 to lead the offense. The Dragons scratched home a run in the first inning and made it stand against Stephens pitcher Dawson Sorrells who allowed just one run on five hits. Jefferson then took the finale 2-1 on March 30. Zac Corbin had two hits, while Watkins had two RBIs. Northside-Columbus went 1-1 in a pair of Region 1 games against Hardaway and Columbus. The Patriots defeated Hardaway 6-2 on March 27. Northside pitcher Colton Joyner allowed Hardaway just two runs (one earned) on three hits for the complete-game victory. Hunter Poe went 4-for-4 with a triple, a homer and four RBIs to lead the Patriots' offense. Bowden McMullen went 2-for-3 with a double and an RBI. But Northside fell to Columbus 6-2 on March 29 and managed just two hits. McMullen’s two-run homer was the Patriots’ only two runs. Northside is 13-8. Perry took three games from Howard in Region 2 play to improve to 11-7. Leadoff hitter Andrew Newhouse went a combined 6-for-12 in the series with a pair of RBIs. Newhouse went 4-for-5 in the Panthers’ 8-6 victory on March 26. John Micah Law was the winning pitcher on March 26 and went a combined 4-for-9 in the three-game set. Tanner Wilson was the winning pitcher in a 3-2 win on March 27 with Cameron Mashburn earning the save. Justin Eckman was the winning pitcher, while Jackson Nipper earned the save in a 7-5 win in the second game of a doubleheader on March 27. St. Pius X has won four straight and is 15-6 overall after taking three games from Oconee County. The Lions defeated Oconee 4-1 on March 26, 3-2 on March 28 and took the finale 9-5 on March 29. Will David hurled a one-hit shutout and went 2-for-3 at the plate with three RBIs in a 4-1 win on March 26. Matthew Turner also had two hits. Then David’s RBI single in the bottom of the seventh helped St. Pius to a walk-off 3-2 victory on March 28. Then David, Wesley Diamantis and Jackson Doyle had two hits each to help the Lions to a 9-5 victory on March 29 to sweep the three-game set. David went 5-for-10 at the plate with seven RBIs, a double and a triple in the three games. Troup won three games in Region 5 play to improve to 15-5. The Tigers defeated Sandy Creek 11-8, Chapel Hill 12-4 and Cedartown 4-0. Cedartown got two hits in the first inning off pitcher Colby Williams. However, Williams retired the final 18 batters in a row and earned a two-hit shutout victory with eight strikeouts. Luke Purnell finished with two RBI hits, while Ethan Morton had two hits. Kenly Bridwell had two hits with an RBI double. Westover pitcher Davis Spalinger played a key role in helping the Patriots defeat Americus-Sumter 5-3 on March 29. Spalinger struck out nine batters and allowed no earned runs or walks. He also had a triple in the game. Woodward Academy has won 14 straight and is 14-3 on the season after taking three straight from Eastside in Region 4 play. Woodward won 10-6 on March 27, 7-6 on March 28, and 5-0 on March 29. Pitcher Will Sanders earned the victory in relief on March 27, while Parker Kahlert went 3-for-4 with a pair of RBIs to lead the offense. Dwight Allen, Allen Thompson, Ethan Cornelius, Chandler Fulton and Christian Wyatt collected two hits apiece. Then Wesley Maxey’s walk-off RBI double in the bottom of the ninth broke a 6-all tie and lifted Woodward to a 7-6 victory on March 28. Sanders and David Greene combined on a two-hit shutout to help Woodward win 5-0 on March 29. Cornelius went 2-for-3 with a double and a homer. Jason Ammons' complete-game performance on the mound helped Appling County to an 8-5 victory over Pierce County on March 29 to grab the lead in the Region 2 standings. Price Eason went 3-for-5 with four RBIs to lead the Pirates. Micah Rentz and James Jones collected three hits each for Appling County, who is 15-5. Cook has won 10 in a row after posting shutout victories over Thomas County Central and Early County. The Hornets took down Thomas County Central 10-0 in five innings on March 27 behind pitcher Tyler Weeks who allowed just five hits and also went 2-for-2 on offense with an RBI. Sam Bennett went 2-for-3 with a double and two RBIs at the plate, while Cole Rogers finished with a hit and three RBIs. Cook then rolled to an easy 8-0 victory over Early County on March 28 to improve to 18-5. Fannin County took two of three from East Hall. The Rebels swept a doubleheader on March 30 by the scores of 7-3 and 7-4. Sophomore Miles Johnson was a catalyst in the two wins. He finished 6-for-8 with five RBIs and hit his first varsity homer. Fannin County is 10-10. Perhaps no team is hotter in Class 3A than North Hall. The defending state champions took three from Union County from March 26-30. On March 26, Charlie Erickson had two doubles and four RBIs to lead the Trojans to a 14-1 victory. The most dramatic win was a 3-2 victory on March 28 when outfielder Dylan Wiley threw out the potential tying run at the plate to end the game. Caleb Clark earned the victory on the mound, while Kelton Kieschnick earned the save. Clark, Reese Olson and Jackson Dyer had two hits apiece to lead the offense. Then the Trojans finished off a sweep of Union with a 9-1 victory on March 30. Clark, Olson, Caleb Wiley, Tyler Brooks and Dylan Wiley had two hits each. Mark Swett earned the victory on the mound, allowing just an unearned run on five hits in six innings of work. North Hall is 14-3. Pike County only played once the week of March 26-31, but the Pirates scored a big 4-3 victory over Ola. Peyton Barman earned the victory with six strong innings, while Coleman Boynton worked the seventh inning to record the save. Jackson Holmes went 1-for-3 with a pair of RBIs, while Taylor Cook finished with two hits. Pike has won seven straight and is 13-5 on the season. Top-ranked Ringgold has won 11 straight and has opened up a two-game lead in the Region 6 standings as the Tigers completed the first half of their region schedule. Ringgold defeated Sonoraville 11-10 on March 27, Murray County 15-0 on March 29 and defeated second-place Bremen 9-6 on March 30. In the victory over Sonoraville, Holden Tucker pitched the final inning and needed just 13 pitches to strike out three batters and earn the save. Andrew Ghormley earned the victory in relief, allowing no runs and striking out two in 1 1/3 innings of relief. Offensively during the three-game stretch, the Tigers were led by Gavin Hollis (3-for-8, three RBIs), Nathan Camp (4-for-7, four RBIs), Ty Jones (3-for-7, homer, three RBIs), Andre Tarver (6-for-8, two homers, six RBIs), Daulton Schley (5-for-11, homer, seven RBIs) and Wyatt Tennant (4-for-7, three RBIs). Tennant allowed one unearned run on three hits and struck out eight in the victory over Bremen. Rutland took a pair of games over Westside-Macon on March 26 to improve to 10-5. The Hurricanes took the first game 15-2 behind Aubrey Merritt, who was the winning pitcher throwing five innings of scoreless baseball. He also went 3-for-4 at the plate. The Hurricanes then defeated Westside 15-0 behind Bryce Martin who earned the victory on the mound. Martin went 2-for-3. Peyton McKinney and Wesley Key drove in two runs each. Bacon County stunned Benedictine twice in Region 2 play. The Red Raiders took a 4-2 victory on March 27, then topped the Cadets again 7-6 on March 29. Bacon pitcher Wes Livingston allowed just two runs (one earned) to earn the complete-game victory. The loss spoiled a 2-for-3 performance from Benedictine's Rome Dean. Bacon then turned around and beat the Cadets 7-6 behind pitcher Cooper Brown who earned the complete-game victory. Caleb Houston went 2-for-3 with a homer and two RBIs to lead Bacon County in the game. Jacob Markiton finished with two hits to lead Benedictine. Bacon County is 11-11, while Benedictine is 15-6. After struggling for most of the season, Bleckley County may be turning things around at the right time. The Royals have won four straight and are 7-9. They scored an eight-inning 4-3 victory over defending 2A state champion Jeff Davis on March 26 in a nonregion game. Lane Kitchens’ RBI single in the bottom of the eighth scored Tripp Purser. Kitchens also earned the victory in relief, working a scoreless top of the eighth inning. Purser allowed three unearned runs in seven innings of work. Bleckley then defeated Hawkinsville 14-1, Toombs County 12-1 and Dublin 6-3. Callaway took three games from Lamar County in Region 5. The Cavaliers are 18-0 in region play over the past two seasons. In the 10-0 rout on March 27, pitcher Chandler Lott earned the victory on the mound and also hit a solo homer. Callaway is 15-4. Thomasville took a giant step toward capturing the Region 1 title by defeating Fitzgerald three times last week. The Bulldogs defeated Fitzgerald 4-3 on March 27, then took a 10-4 victory and an 8-7 win on March 29. Pitchers Buck Bennett and Hurston Waldrep helped Thomasville to a 4-3 win on March 27. JT Rice went 2-for-4 to lead the offense. Harrison Stewart and Parker Zolt led Thomasville’s 10-hit attack with a 3-for-4 performance in the 10-4 victory on March 29. Hayden Donalson, Jimmy Cipriani and Rice finished with two hits each. Then Rice’s RBI single in the eighth helped the Bulldogs to an 8-7 walk-off victory in the second game of the doubleheader. Bennett went 2-for-3 on offense with a homer, a double and three RBIs. Thomasville is 18-4. Vidalia leads the Region 2 standings by a game after taking a pair of victories over Metter. The Indians defeated Metter 5-0 on March 27 behind pitcher Riley Powers who hurled a one-hit shutout to earn the complete-game win. Alex Sutton and Landry Mead led the offense with two hits each. Vidalia dropped a 3-0 decision to ECI on March 28. Mead and Garrett Gillis led the offense with two hits each. Vidalia then closed the week with a 6-3 victory over Metter as Sutton earned the victory on the mound and Hall Graham earned the save. Sutton and Powers finished with two hits. The Indians are 12-9. Baconton Charter took a pair of Region 1 victories over Randolph-Clay on March 29 to remain in the thick of the region chase. The Blazers (9-4) dropped a 7-1 nonregion contest to Worth County on March 27. Bowdon has won seven of its last nine. The Red Devils split a pair of games last week, beating Chattahoochee County 9-4 on March 27 before falling to Trion 9-7 on March 27 in a Region 6 contest. Coleton Pitcock led the offense, going 3-for-4. Wesley Scales and Trent Estes had two hits each. Scales had a double and a RBI, while Estes had a triple and two RBIs. In the loss to Trion, Bowdon wasted a 2-for-4 performance from Hunter Braswell. He and Pitcock finished with a pair of RBIs each. Clinch County pitcher Duncan Lutz allowed just two unearned runs on one hit to earn a complete-game victory over Wilcox County on March 27. Lutz struck out eight while also going 2-for-4 with a double and pair of RBIs at the plate. Clinch also got a 4-for-4 performance from Kyle Hendricks, who finished with three RBIs. Laneston Hendricks (three RBIs), Brence Cason and Warren Stovall collected two hits each for the Panthers. Stovall, Josh Peagler and Michael Gilbreth combined to shut out Atkinson County 8-0 on March 30. Stovall and Thomas Lankford collected two hits each to lead the offense. Stovall finished with three RBIs. Clinch County is 13-7 on the season. It was a brutal week for Commerce in Region 8 play. The Tigers lost region games to Prince Avenue Christian, Athens Academy and Hebron Christian by a combined 30-5. Will Slater went 1-for-2 with a double and two RBIs in the 5-3 loss to Athens Academy on March 28. The Tigers are 11-10. ECI scored three victories during the week. The Bulldogs defeated Calvary Day 3-0 on March 26, Vidalia 3-0 on March 28 and they defeated McIntosh County Academy 12-1 on March 29. Tyler Flakes and Peyton Mercer combined on a two-hit shutout as the Bulldogs topped Calvary Day 3-0 on March 27. Flakes worked six innings to earn the victory, while Mercer earned the save. Cody Collins and Chase Whitehead had two hits each, while Chandler Shockley’s double scored a pair of runs. Irwin County finished the week strong with a dramatic 3-2 eight-inning victory over Telfair County on March 29. Reid Fletcher’s two-out RBI single scored Will Hudson for the game-winning run. Zach Smith earned the victory in relief, working 2 1/3 innings of scoreless baseball to improve his season record to 6-0. Fletcher finished 2-for-4 at the plate to lead Irwin’s five-hit attack. The victory followed a disappointing 10-8 setback to Marion County on March 26. Irwin County wasted a 3-for-4 offensive performance from Fletcher. Chad Miller went 2-for-4 with three RBIs in the loss. Irwin County is 15-3. Jenkins County dropped a pair of Region 3 games this week. The Eagles fell 7-1 to Johnson County on March 27 despite Cannon Griffin going 3-for-3 with an RBI at the plate. In a 10-2 loss to Calvary Day on March 29, Jenkins County managed just one hit. Payne Hunter went 2-for-3, while Doug Curles went 2-for-4 with an RBI to help Pelham to an 11-1 victory over Pataula Charter on March 26. Curles, Levi Jacobs and Josh Beck finished with two RBIs each to help Dakota McEntyre earn the victory on the mound. But the Hornets dropped a 9-2 decision at Seminole County on March 30. Gunner Wisham had two of Pelham's five hits in the loss. Pelham is 9-6 on the season. Schley County has won four in a row after a nine-inning 6-2 victory over Crisp County on March 27. The Wildcats scored four runs in the top of the ninth to break the 2-all tie. Dylan Taylor and Camron Belcher had RBI singles in the ninth, while Lorne Barineau earned the victory in relief. Ashton Goodin led the offense going 3-for-4, while Belcher and Garrett Peavy collected two hits each. Taylor County’s Gunnar Watson broke open a tight game with Crawford County on March 27 with a sixth-inning grand slam that propelled the Vikings to an 8-1 win. Watson finished 2-for-3 with five RBIs and was also the winning pitcher. Ezra Cummings and Jacob Pounds also finished with two hits each to lead Taylor. Watson and Diego Paz finished with three hits each to help Taylor to a 14-4 victory over Marion County on March 30. Watson finished with a homer and four RBIs. In the two games, Watson 5-for-7 with two homers and nine RBIs. Taylor County is 11-3. Telfair County went 1-2 during a brutal stretch that included games against Charlton County, Appling County and Irwin County. The Trojans managed just three hits in an 8-1 loss to Charlton County on March 27, but they rebounded to beat Appling County 4-3 on March 28. Cameo Blankenship earned the victory on the mound, while Ramsey Hancock, Blankenship and Harrison Wood finished with two hits each. Blankenship finished with two RBIs. In Telfair's 3-2 eighth-inning loss to Irwin County on March 29, the Trojans wasted a masterful performance from pitcher Ryan Dopson who allowed three runs on five hits in 7 2/3 innings. Wood went 3-for-4 on offense. Telfair County is 11-7 on the season. 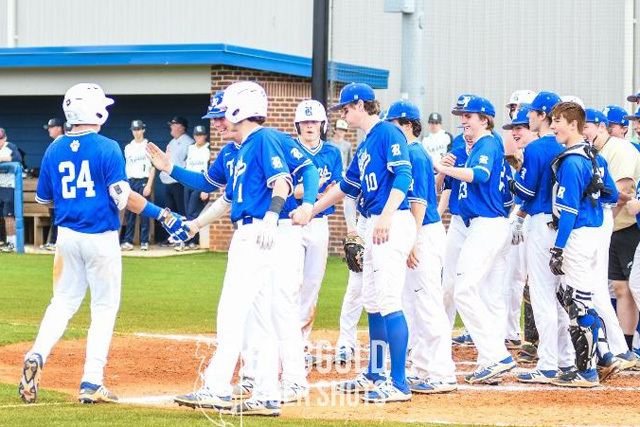 Trion won three games, including a 9-7 victory over Bowdon on March 27. Cole Phillips went 3-for-3 with two homers and five RBIs. The Bulldogs also defeated Mount Zion-Carrollton 15-7 on March 28 and defeated Mt. Zion 20-5 on March 30. Trion is 8-5. It was a tough week for Wilcox County. The Patriots managed just one hit in a 12-2 loss to Clinch County on March 27. Wilcox dropped an 11-2 decision to Johnson County on March 29. Rhett Davis went 2-for-3 to lead the offense in a losing effort. Wilcox fell to 9-7 on the season. Brookstone has won 10 straight and sits atop the Region 4 standings. The Cougars were idle. Mount Paran Christian has won seven straight and is 16-1 on the season after a pair of wins over Pinecrest Academy. The Eagles won 6-4 on March 27. Pitcher Zach Feldman earned the victory and Austin Ross earned the save. Jack Alexander went 3-for-3 with two doubles, a homer and four RBIs. In the Eagles’ 7-3 victory on March 28, Alexander went 2-for-3 with an RBI, Nick Swanson went 2-for-5 with two RBIs and Ross went 2-for-4. Andrew Bennett had two RBIs. Swanson also was the winning pitcher. Mount Vernon Presbyterian’s Tres Gonzales hurled a one-hitter and struck out nine in the Mustangs’ 7-0 victory over Paideia on March 27. Alex Thomas went 2-for-3 with a double and an RBI to lead Mount Vernon’s offense, while Clayton Mourey went 1-for-3 and drove in a pair of runs. Christian Smith had Paideia’s only hit. It was a tough week for Pinecrest Academy. The Paladins tied Holy Innocents’ 10-10 on March 26 when play was suspended in the bottom of the seventh. It spoiled a 3-for-3 offensive performance from Ben Gobbel and a 2-for-4 performance Patrick O’Rourke. Gobbel had three RBIs. Then Pinecrest lost a pair of Region 6 games to Mount Paran Christian. In the 6-4 loss on March 27, the Paladins got homers from Caleb Bohn and Will Patota as both finished 2-for-4 at the plate. Bohn had a pair of RBIs. Then in a 7-3 setback on March 28, Gobbel and Mickey Mangan led the way with two hits each. Gobbel had a solo homer. Saint Francis scored a pair of Region 6 victories over Mount Pisgah Christian. In a 4-2 win on March 27, pitcher Will Clark allowed just two runs on four hits to earn the complete-game victory. He struck out 11. Zach Nozick went 2-for-3 at the plate with two RBIs. Then in a 6-5 victory on March 29, Bret Madren went 4-for-5 with a walk-off single in the bottom of the seventh to break a 6-all tie. Strong Rock Christian won a pair of games at the Disney Wide World of Sports Complex in Orlando, Fla. They defeated Timothy Christian (Elmhurt, Ill.) and Wheaton Christian (West Chicago, Ill.). In the 12-2 win over Timothy Christian on March 26, pitcher Trey Shirah earned the victory allowing two runs (one earned) on four hits in five innings. Nick Hassan went 3-for-3 with four RBIs, Brayden Eidson went 3-for-4 with four RBIs, while Kenny Mills and Hunner Lawrence finished with two hits apiece. In a 19-9 victory over Wheaton, Strong Rock rallied from a 5-0 deficit. Eidson, Shirah, Andrew Gord, Lawrence and Jekhi Swanson finished with three hits apiece. Gord and Shirah had four RBIs each. Strong Rock is 16-5 on the season.